Terrell Owens worked eight hours in a Goodwill store in Studio City, CA. It’s been a very tumultuous 2012 for Terrell Owens. After showing up on Dr. Phil and revealing that he has a lot of baby mama drama, it was also revealed that he’s trying to hold onto these relationships with women despite falling behind on child support payments. Not only that, his source of income isn’t as very strong as he was unable to latch onto an NFL roster for the regular season. As pointed out by Black Sports Online, that all led to him being forced to work at a Goodwill store for eight hours as part of community service for being behind on child support payments a traffic violation. I'm no longer a Seahawk. I THANK the organization 4 the opportunity, I'm truly blessed beyond belief. My FAITH is intact & will NOT waiver. Aside from the near overdose of drugs, the constant complaining to everybody and his child support issues, Owens has always prided himself in being a very in-shape, talented football player. He has Hall of Fame career numbers and after knee surgery, we wondered if he had anything left. His time with the Seahawks ended today and some may wonder if that was the last opportunity he would ever have in the NFL. He was in shape and appeared to be in good spirits about this opportunity. But unfortunately, the Seahawks didn’t like what they saw and they got rid of him. As I watched the preseason games this year, I realized that Owens had numerous opportunities to make an impression to the team. But I think that ultimately, his one weakness as a football player caught up to him. He just doesn’t have great hands. Watch out before T.O. says something dumb again. 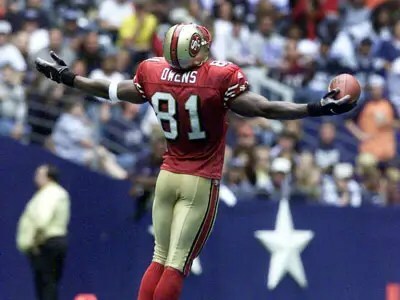 If you haven’t heard the news, Terrell Owens is joining the Seattle Seahawks on a one-year deal. This comes to me as a surprise as I thought his NFL days were over. He hasn’t played since 2010 and was coming off knee surgery. But Pete Carroll apparently likes trouble making wide receivers. They have Braylon Edwards, had Antonio Bryant, and now T.O. joins the mix. This is an odd time for Owens because instead of celebrating from the public, most are now laughing and wondering when he’s going to screw up. With his history of selfishness, locker room troubles, off-field issues with child support, and everything else, nobody seems to believe that he is worth the trouble.